Last month’s news of head of MINI design Anders Warming’s precipitate and unexplained departure from BMW as was a shock to the industry comparable to Chris Bangle’s exit in 2009. That may be as nothing compared with the news of his new appointment as Borgward AG’s Board of Management member responsible for Design, to begin on 1 January 2017. He is belatedly reversing the trend begun by Wilhelm Heinrich Gieschen, Karl Monz, and numerous others who took the one-way journey south from Bremen in the early 1960’s to create the new BMW in Borgward’s image. Except of course, neue Borgward is headquartered in Stuttgart, and answers to Beijing. There are inevitable comparisons to be made with Gert Volker Hildebrand, who went from MINI to Qoros. Hildebrand was responsible for the only BMW MINI I find appealing or clever, the original Clubman, but his career had peaked some time before he joined Qoros in 2011 at the age of 58. I have no enthusiasm for Warming’s gross Clubman, but the 43 year old Dane’s career is impressive: Art Center College of Design in Pasadena from 1992 to 1996, VAG Design Centre Europe 2003-05, head of BMW Exterior Design and Team Leader Advanced Design at the BMW Group before being appointed Head of Design at MINI in 2010. If nothing else, the appointment suggests deep pockets at BAIC Foton, and notions of achieving at Borgward something akin to the Schreyer effect at Kia. Borgward have started well; the exterior and interior design of the BX7, BX5, and BX6 is derivative and short on subtlety, but it is competent and literate. Anders should at least have more of a free hand than he was permitted at MINI. The goitred Countryman, and the UKL-platformed cars make a nonsense of the brand’s name. They’re bloated cars, unloved by motoring’s chattering classes, but which nevertheless sell in healthy numbers because they meet a need nothing else quite does, and even make BMW a modest profit. I don’t know if that’s really why he went, but I wish him well at Borgward. After stupidly imagining that Peter Schreyer was retreating to some Korean backwoods, because he couldn’t hack it with the big boys, I’d be reticent to state that Borgward seems a bit of a long shot. It says something about the ossified state of car design that designers are rejecting a steady career path inside established and/or prestigious firms to take long shots elsewhere. However, the salaries offered are often huge and so the financial risk is small; if you’ve been pocketing €150,000 p.a. for a decade and then, say, ask for €175-200K for another three then there’s a good reason to start with a clean-ish sheet brand. If things don’t work out the house is paid for and a nice quiet job teaching would fill in the time to retirement. Urgh not that old tired and trodden chestnut of MINI not living up to its bloody name again. Please move on and when you write or think of the letters that form the word MINI think of them forming the word AMOEBA or BANANA. The fact that the four letters also mean mini or small has ZERO relevance to the brand these days. Please just move on and get with the times. As to designers moving to “non-brands”. It’s an utter no brainer apart from the better salary. You and you alone are in control with far less meddling from up high. Even if the salary was the same I can totally see why any designer would jump from being one of many to be THE one designer of a brand. I think the big difference between the Mini idea and the thing it has become is jarring. For me the designers’ wish to try their hand at a marque with no baggage and the prospect of a bigger paycheck makes these moves very sensible. Schreyer has done very well, for example. Johann. Although I’d quite like to see a small MINI as part of their range, that’s not the issue really. It’s applying the styling tropes of an ‘iconic’ 60 year old small car to a whole series of vehicles and thinking that will produce something aesthetically pleasing. I understand the problem – once you ditch, say, the grille, what differentiates a MINI from, say, a Kia? But, really, they should have a bit more confidence that the reputation their product has acquired for its driving dynamics could allow them not to be so dogmatic about the styling which, to my eyes, now has all the usual problems you get with long-term inbreeding. Sean I totally understand that but you can say exactly the same of the Fiat 500 and the Beetle. It has NOTHING to do with the four letters that spell this company’s name. ZERO. That pastiche retro styling corners you into a dead end at some point, is the issue you’re referring to. Not the name of the company. That is the only part I was referring to above, that I want people to get beyond and stop rehashing. It’s a tired argument. The irony with Mini is that it carries a lot of baggage. It is true that the idea of Mini as Issigonis conceived it is long, long dead and that BMW successfully reinvented the concept for our times. The problems lies in where BMW have taken the marque since then. Frank Stephenson got the design of the 2000 Mini exactly right, but everything that followed has only muddied the clarity of that vision. At the same time, whilst BMW are right to amortise platform costs across marques, the current UKL-based Mini is a big small car, the Clubman even bigger. BMW were clearly serious at one time about the smaller Rocketman, in which case upscaling the Mini would have been moot, but the business case did not stack up, leaving Mini with a Maxi. So where does Mini go from here? There is nothing intrinsically wrong with any of the moves that Mini has made (although two convertibles is a bit of a puzzler), except that both Gert Hildebrand and Anders Warming have clearly struggled to get a handle on what the brand owners and Mini loyalists want. Porsche faces exactly this problem with the 911, except that Stuttgart is more adept at handling their geese that lay golden eggs. A better example closer to home might be Land Rover, who have spun out many of the design tropes shared by Mini into numerous models to mega profits and great acclaim. Johann. I think the application of the (2007) Fiat 500 to bigger vehicles is exactly the same thing that MINI have done, but worse. The 500L is a horrible thing to my eyes but, of course, immensely more popular than the Multipla that I so admire ever was. As for the New Beetle, it has always seemed a dead end, and the New New Beetle even more so – it certainly puts MINI’s achievements in a far more positive light. The problem with non-brands is that it is a gamble that you will ever see your work on the roads. There possibly comes a time in your career that you are so infuriated with the industry you don’t care and/or, as Richard points out, you can consider it as a very well paid sabbatical. Chris: the other evolving brands you name don´t have the word “small” built into their name. A Porsche and LR can be pretty much anything if engineered correctly. Mini can´t make a large call small and still have a sensible brand name. No one ever complained that Triumphs could be quite ordinary or that DKWs weren’t steam driven. Well, not in Surrey when I was a kid anyway. Richard: that’s true, but in a market increasingly defined by corpulent CUVs, Mini could quite easily strike up to anything Golf-sized and still be seen as a maker of small cars. The trouble is, all the cars they are making at the moment are towards the larger end of that spectrum. But if the marque has surely proven one thing, it is that they can make a small car and charge a good amount for it, which makes BMW’s decision to ankle the Rocketman all the more disappointing. Also, Land Rover has been known to sell FWD cars. Crazy, but it’s true. It seems to me you all are going on about the MINI Clubman as if it is the size of the Starship Enterprise. In actual metal the new MINI Clubman is shorter than a Ford Focus. Length of a Focus hatch: 4,358mm and length of MINI Clubman: 4,275mm. Honestly. Just because it has very low and long proportions doesn’t mean it is actually the 5,000mm long that it looks. So if something Golf-sized is indeed still seen as small, as alluded to in the previous comment, (which it certainly is in a country like the USA) then MINI still makes small cars. I like the new Clubman. It is the only one of the current batch that I like without making caveats for how it looks or is sized. Looking again at Borgward’s three current concepts, as Robertas says, they look like convincing proposals (as did Lotus’s under Dany Bahar) but they lack anything at all to attract anyone to them instead of the usual bunch, unless of course it’s price. If they’re putting BX7 on the market next year, Warming can’t do much about that, so it’s the nascent BX5 and BX6 that I guess he’ll go to work on. As much as I have sympathy for Johann’s viewpoint, the truth is that amongst the automotive chattering classes, the subject of perceived corpulence remains of issue of domestic elephantine nature. Look at it this way if you will. Imagine Porsche’s current range of cars being offered if no 911 model was available. Porsche would be a laughing stock. To the purists, MINI is in a similar position. The average buyer of course couldn’t care less. BMW/MINI would probably tell you that MINI is more about an attitude these days than about being small, large or anything in between. It says, ‘I’m a bit leftfield. I might have a wife and kids but I still like driving and I’m not quite dead below the waist just yet.’ Unlike some here, I don’t mind the new Clubman. To my eyes it is the most coherent of the current generation, it’s scale allowing it to handle the styling tropes which overwhelm the more mainstream versions. At least it suggests an attempt to move the styling conversation forward. I expect the forthcoming Countryman will also look quite resolved and will prove to be the major seller. Having said that, a man of Warming’s obvious talent was clearly not being allowed to do as much as he would have liked – his most recent MINI concept was superb by the way – so the move isn’t a huge shock. The other dilemma BMW now face is who to replace him with and how to evolve MINI’s styling from here. I know Eóin. But every time someone (on this forum) sees a MINI, please just replace the four letters you see there with AMOEBA or BANANA. You will lengthen your own life by many hours by having less stress about worrying about the meaning of the four letters and that it is on a car that is over 4,2 m long. Trust me on that. For the record I like the Clubman too – inside and out. It’s quirky. And having recently rented a few DriveNow MINIs in London (which I joined ONLY to get to drive the BMW i3 (which is astonishing)) I’m very much impressed by how the MINIs sound and drive. They don’t have Clubmans in the DriveNow fleet sadly – they prefer to use hideous 1-series monstrosities instead – so I’m yet to drive one. But I’ve been in plenty at motor shows and it is not as patronising inside as some of the older MINIs. And it is a decent size albeit a bit more compromised inside than a Golf or Focus. But so what. It’s quirky. We should celebrate the AMOEBA Clubman for that. 99johann: I would be interesting in reading your write up on the i3? 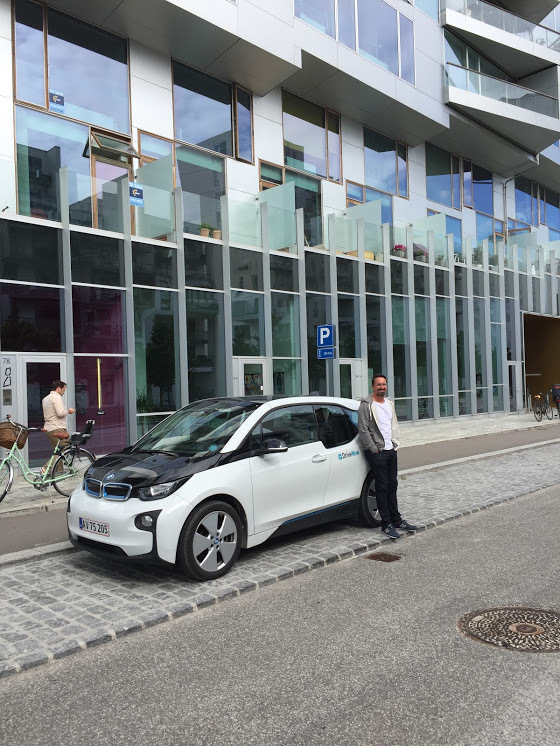 I should do that aye… I’ve rented a DriveNow i3 in London once and had two more in Copenhagen. And trust me at 34p/min I’m certain I’m going to do it again a few times just for the heck of it! 0-40 mph is A M A Z I N G.
Just the other day a client remarked that he was test driving a Golf GTE PHEV, which seems like such an ambitionless proposition compared to the i3. Then again, he seemed rather charmed by it and will be leasing via his business anyway, so the numbers are all important there. Super picture, by the way. I uploaded it to lose the link. Hope that’s OK Johann. Though I must say, on the photo, there’s a distinct similarity to Mr Warming. So we’ll take your praise of the New Clubman with a pinch of salt, then? Thanks for fixing the pic Sean. And I would give anything to have rather been a car designer than an architect – as to the similarity you mention. But in saying that I LOVE architecture and being an architect too. I mean I get to have a white Toyota Corolla sedan as a company car in Istanbul! Whoop! Eóin – By the most recent MINI concept do you mean the MINI Vision Next 100, one of the concepts recently realised to celebrate the almost-103rd anniversary of the foundation of Rapp Motorenwerke GmbH? Much more to my taste, with its monospace tendencies, four trick doors, and ultra-minimal interior. I might even forgive them if it turns out to be as big as an X5!